My next book, A Well-Timed Murder, is about the Swiss watch industry. In it, Agnes Lüthi investigates the murder of a prominent watchmaker, Guy Chavanon. Agnes quickly learns that despite the industry’s reputation, nothing about the man’s death seems precise. Ultimately, timing will be the key to law enforcement, and possibly to love as Agnes races to stop the killer before he strikes again. 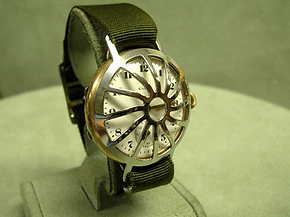 While writing A Well-Timed Murder I dove head first into the watch industry. Today, with a ‘watch’ on every smart phone and inexpensive wristwatches that keep accurate time, we don’t give much thought to how time controls our life. For thousands of years, time related to the rise and fall of the sun. The Egyptians divided the day into two 12-hour period and used obelisks to track the sun’s progress. In the early 14th century mechanical clocks yielded more precision. As the century progressed, watches (as jewelry) developed as novelties for the wealthy elite. In the late 19th and early 20th centuries pioneering pilots strapped timepieces to their wrists so they could keep track of fuel usage. At the same time, the British army required greater coordination and timing among the troops. Clearly the need for practical and precise wristwatches had arrived. Fast forward to today and every person with a smart phone can mark time to hundredths of a second. Time is now everything. Watches are appreciated for their beauty and collectability. Every minute of our day is accounted for (and in some industries billed-for). We have greater accuracy but, perhaps, that’s not always a good thing? I wonder how people mark their days now. Through constant checking of the computer clock, their iPhone, or an antique Patek Philippe? And does the constant realization that minutes are slipping past help or hurt us? I have days where time seems to stand still. Those are the days I want to capture. That’s the kind of timing that means everything. Had a chance to ‘sit down’ with Fiona Mcvie despite being on opposite sides of ‘the pond.’ We talk about my background and what’s up today…. Vladimir Arsov was my father’s favorite character from the day I started work on the manuscript and every time I trimmed Arsov’s story I got a phone call or text saying “WHY?” followed by “I understand….” We used the full range of tearful emoticons. As a tribute to my father who read every draft (and I do mean every single one), I wanted to share one of his favorite missing sections. If you are a fan of Arsov’s I hope you will enjoy this little foray. You will also notice that when these parts were cut they took other characters and subplots with them…. But that’s the history of editing, another topic entirely. Vladimir Arsov spoke before giving Gillespie instructions for the fire. He had very specific ideas about how the logs were to be laid. Good ideas, actually, and it was much warmer in the little circle near the hearth since he had taken command and banished the servant whose task it usually was. “This is where you learned to build bombs,” Gillespie said. The training hadn’t sounded the same during the interview. Gillespie thought it had sounded like a skill learned at trade school: how to cobble together a bomb from scraps of metal and gunpowder, how to use tar to make it adhere, and how to cut the fuse so that it would light at the right time. How to create death and destruction from nothing. “I was in the city for months,” Arsov said, “throughout the beautiful spring and hot summer. I was still young and thought the German army was coming for us—I think I imagined the same men who had killed my mother would track me down—but the men who understood strategy said no. The Germans had failed to take Moscow, then been driven back by the cold winter, they would spring forward again to that purpose. In the end they were wrong and my instincts were correct. Hitler himself had decided the oil fields of the Caucuses were more important than Moscow. And Stalingrad, the city and battle that was a turning point in the war, a name that will forever be synonymous with horror and suffering, was originally only one minor point on the German sweep. “By summer, we felt them coming like a great cloud just over the horizon. In July the cities started to fall. The army advanced from the south and the west. Voronezh on the Don fell, then the Germans crossed the Don at Rostov; two days later they captured Rostov-on-Don. By the end of the month we had our orders. They were military orders, but we understood they were for us all: not one step back. Stalin himself said the city was not to give way. This was the city where Stalin built his own personal myth during the revolution and our national pride rested there, the burden was for us enormous.” Arsov grinned. “Did I mention the pride? “In August, the German General Paulus and his 6th Army marched steadily onward, amassing nearer with each day and by then even I knew that this was different from the small gang that had killed my family. This was an army and they were bent on destruction.” Arsov lit a new cigarette and stared into the distance, as if no longer seeing the room but the city in the past. He shook himself slightly. Neither Gillespie nor Rosemary spoke or moved and Arsov continued, “We had limited food, no new supplies and still the Germans amassed from the west. The worst of the attacks came at the southern part of the city, near the grain elevator and main rail station. This is where the artillery pounded day after day. I worked near the Red October Steel works, and we hunkered down, working until our eyes were bleary, not able to think beyond that moment. By November the Germans had launched six major assaults and we were exhausted. Grime caked my eyes and filled my ears. I had not changed my clothes since that first day, months before. We were teeming with lice and filth, but were consumed with the work of survival. The entire Russian population had been reduced to five miles along the river and the steelworks and Barrikady arms works and I hadn’t seen daylight for weeks. We moved like sewer rats between buildings under cover of darkness, or through tunnels made of building rubble and, yet, still they came. This was the hell that made me forget everything that had come before,” he paused. “And then it worsened. “But you lived,” Rosemary whispered. “Lived? None of us lived, but I survived. This terror lasted until November 19th. On that day we saw that all was not lost.” Arsov examined his cigarette. “Or to a Russian soul all was not lost. We have great capability for suffering and ability to imagine victory despite all evidence. In this way we are different from the Americans. The Americans fight because of their optimism; their self-righteousness. I think this is rooted in your first war, in your revolution, which was a battle amongst friends. Our willingness to fight is rooted in the harshness of our past and our centuries of resilience. It is a different characteristic. “This is when the Red Army reserve swung around and circled the German General Paulus,” Gillespie said. “Was that the end?” Rosemary asked. Take the concept a step further and the value to elevating discourse about creativity is immeasurable. NaNoWriMo is much more than one month a year. The Young Writers Program takes the notion of creativity into K-12 classrooms around the world. Camp NaNoWriMo is a virtual writing retreat for fiction and non-fiction alike. The Come Write In program is a free resource to libraries and others who are promoting reading and writing in their communities. Writing leads to reading and vice versa. And both writing and reading lead to greater success in all aspects of life – listening and speaking skills improve, analytical skills strengthen, focus and concentration increase, and stress is reduced as the mind focuses. So whether you are a writer or a reader or both let’s give a shout out to everyone who participated in NaNoWriMo this year! For more on NaNoWriMo visit their website at NaNoWriMo.org and get ready for 2018. A book club for men. Writers love books, right? Which must mean that writers love book clubs. After all, this means that people are coming together under the auspices of reading. Recently I’ve talked to several people about their book clubs – clubs of long standing, walking clubs, clubs that meet every month and those that meet four times a year. Clubs that are mainly social clubs and others that are serious discussion only. The common theme – apart from the books – was that they are all women. This started my quest for a book club for men. Turns out it wasn’t hard to find. Not only did I find a few, I found one that struck me as very special. The Short Attention Span Book Club (SASBC) located in the community of San Luis Obispo, California. The founder, Will Jones, retired from a career in public education (high school English teacher, high school administrator, high school principal) and was interested in next steps. He first started a website called Everyday People where he posted poems he’d written and reviewed books and movies in a section called Short Attention Span reviews. From this the book club was born with the theme ‘short attention span books’ (300 pages or so). Since they started in February 2012, they’ve have only missed a few months and have read well over 50 books. As an author I like books clubs because people are reading books, but my exchange with Will reminded me that books are about far more than reading. They are about connecting with people. “We’ve had vibrant, rewarding email exchanges with three authors: Larry Watson (Montana 1948 and American Boy), William Giraldi (Hold the Dark), and Jess Walter (Beautiful Ruins). Larry Watson acknowledged his debt to book clubs and wrote that our club name was the best he’d heard to that point. Two local authors, John Hampsey (Kaufman’s Hill) and Franz Wisner (Honeymoon with My Brother) have attended meetings to discuss their books. We attended a Q&A with Kevin Powers (The Yellow Birds) at Cuesta College, a local community college that had chosen The Yellow Birds as its book of the year. We all got to meet Kevin and have our copies signed by him. “I keep updating our list of possible books to read. I recently added several to the classics column that were written between 1910 and 1920 because one club member has a habit of asking which books we’re reading might still be well regarded in 100 years. “We are a relatively homogenous group: college educated professional seniors, most either fully or partly retired. We rotate houses for our meetings, which start at 7:00 and usually end by 9:00 or 9:15. We have a great time, but there’s very little idle chit chat. We spend a few minutes sharing “what’s up,” choosing future books to read, agreeing on date and location, and then we dive into our discussion. He included a two column list of books (attached below) they use as a resource for choosing which books to read. Books with an x next to them are books the SASBC has read (the final two are the next up in their rotation). A big hit recently was O Pioneers by Willa Cather and he notes that they will probably read the other two books in her prairie trilogy soon. This has made me curious about books clubs – what works and doesn’t work? What are people reading and way? Mystery and thriller writers are often asked – how do you plot your books? For the truth of the matter is that whether the author plots in advance or flies by the seat of their pants and then fixes, the mystery/thriller writer is paying attention to the clues and red herrings that bring their story to a satisfying end. This makes clues and red herrings the mystery writers stock in trade. They aren’t, however, all of the stock needed to arrive at a satisfying end. I like to think that misdirection is the mystery writer’s friend. What are some strategies for misdirection? Strategies require thought and application. Writers use post its and charts, they think about foreshadowing, investigate the rabbit holes of misdirection, and plot backwards from the end to check the sequence. The critical part of all these strategies is a satisfactory conclusion to each point. For what is truly important is that the reader buy into the ending. There is a fine line between the reader identifying the guilty party too early and not being able to identify them at all. The solution should evolve, so that when it is revealed it is the nicest mix of surprise and a satisfied ‘of course’! This post appeared concurrently on MissDemeanors.com, which was recently spotlighted in Writer’s Digest as one of the 101 best blogs for writers. (And it was one of only three named specifically for the mystery genre.) It was a thrill for our group – our Andy Warholian fifteen minutes of fame! That said, don’t worry if you didn’t see the list, or if you read over http://www.MissDemeanors.com if you did. There’s a lot of information out there these days. Part of me embraces the connectivity. That’s certainly why I blog with these wonderful fellow writers. Writing can be an isolating experience and staying in touch via electronic media helps. Fifty – even twenty – years ago we would have written letters. More personal? Perhaps. But also limiting. I doubt the MissDemeanors would have all participated in a weekly round robin letter. While I appreciate, and value, all of the on-line resources available today, I can’t help but also give a shout out to the old-fashioned kind. Strunk and White anyone? I still have two copies on my shelf near to hand. And the newer and hipper Eats, Shoots & Leaves by Lynne Truss? I keep it on my nightstand – it is truly urbane, witty and very English as the book jacket proclaims. A chance to be entertained and learn a thing or two. My point? How do you wade through “what’s out there” without merely marking everything under the sun as informative and to be read later? In my case, I stick with a few resources. Writer’s Digest being one of them. I also try to follow Jane Friedman as much as possible. After that, I attempt to keep in the loop about conferences both local and national, big and small since they are wonderful face-to-face opportunities to connect with both writers and readers. And I confess to loving Twitter – in small doses. It’s like taking the pulse of the world. And I keep my old stand bys – the Strunk and Whites of the world – at hand. When the internet crashes, I’ll be thankful they’re here. (I’m blogging this week with my fellow writers at MissDemeanors.com and this post appeared there as well. Follow us every weekday where we chat about writing and any other thing that strikes our fancy). My neighbor is a big reader and we had an interesting conversation over the fence this lovely spring weekend. He doesn’t like to read elaborate descriptions. To him, an elaborate description is the gun on the tabletop in scene one that never gets discharged. He gave an example: in the thriller he is currently reading there is a scene where the protagonist walks down a long corridor. The scene is complete with a detailed description of the doors the protagonist passes, what he sees at the other end, etc. In the end, the man gets to the end of the hall and goes into a room. My neighbor read the passage carefully, sure that the careful attention to detail meant that there were important clues in the text – or at a minimum something would happen behind one of those doors. He felt that the description made it difficult to separate important detail from general atmosphere. This is a problem for writers. First of all, no two readers are the same, so you can’t satisfy everyone. Some people like to use their imagination to fill in most of the details of places and people. A long narrow corridor. A tall dark stranger. Good enough. They’ve got the idea and the tall dark stranger gets filled in with their ideal, not the writer’s. Same thing with places. My long narrow corridor may look different from everyone else’s, but does it matter if there is crown molding or not? I believe that there should be enough detail to get close to what the author imagines, but I can sympathize with the notion that too many details are information overload for a reader. This came up in my conversation with my neighbor. Afterwards it struck me that the average reader’s access to information has altered what we want. Think of Charles Dickens or Leo Tolstoy or Victor Hugo. These men were literary giants in their day, hugely popular in every sense of the word. They set a scene that was possibly unimaginable to their readers – a glimpse of the darkest side of industrial England’s workhouses and slums and law courts. The vast battle fields of Russia and the gaiety of aristocratic balls. The dark currents of Paris, including those running under the streets. These scenes were so finely wrought that they are useful to historians today. Modern society has access to images on television, at the movie theater and on-line. Take Industrial England. Google it and you are overwhelmed by images and descriptions (not all accurate, but that’s a separate issue). No longer are novels the main form of exposing people to faraway places or ideas. As a result, we have adapted as readers and therefore as writers. Or have we? Description still plays a vital role in a novel. I read to remember places I’ve been, and to dream about places I’ll never go. For me, it remains a balance. I want to see into the mind of the author, all the while knowing I’ll continue to fill in details from my own imagination. That’s also my goal as a writer. I’m curious, though, what do others want? Plenty of description or spare spare spare? There is definitely room for both. Am I working on one or three? This is not an uncommon situation – in fact, I should acknowledge how fortunate I am to be a ‘working’ author at all. However, there is something a bit odd, perhaps even awkward, about being in the midst of finalizing, working on finalizing and at the beginning all at the same time. Swiss Vendetta is in some ways a thing of the past – I’m still out and about in bookstores and libraries talking about Agnes’s first adventure in Violent Crimes – however, what I’m really thinking about is A Well-Timed Murder, her next adventure (set amidst the watch industry in Switzerland). No cover art yet, in fact I’ve not seen the first round of edits….. so I’m in waiting mode. Did I mention that I’m waiting? The moment an author hits send the waiting begins. I like to think that I’m a patient waiter. I like having some distance before getting this all important feedback from my editor. Too soon and I might not be ready to hear suggestions. Hit it just right and I can read with a fresh eye. Certainly time and distance will have made me re-think some parts of the book (the question is will my editor and I agree on the changes…. back to waiting patiently). I won’t bother fretting (will my editor want changes that I agree with?). I defer to Stephen King on this – and I paraphrase – writer’s write and editor’s edit. At the same time, I’m well into research for book three. I know what the big theme is, I’m working out the various characters, and have some ideas for the story (beyond the big idea). There’s still time for the story to evolve and change and likely it will look much different when finished that I envision it now, but it is the next big project! This is where I want my mind to be 100%. On the other hand…. the mental hopper needs time and feeding and when I get A Well-Timed Murder back (today? tomorrow?) I am ready to dive in and rotate a bit backwards in the cycle. I’m curious, though, how do other authors do this? Wait until one is completely finalized before starting the next? Or is everything always on a middle, simmer burner?